Just as impact craters span a range of sizes, they also span a range of ages and states of preservation. A crater that formed a month ago, for example, has crisp, sharp details and is likely surrounded by a splatter pattern of dark rays. At the other end of the range lie craters so worn and eroded that they are hard to identify as craters at all. On Mars, nature provides a continuous spectrum, or continuum, of craters from fresh and well-preserved, through partly modified, to nearly obliterated and destroyed. Craters at the range's extremes are easy to spot and label, but determining where a crater lies in between the extremes is more difficult. When trying to gauge a crater's degree of preservation, scientists find it useful to ask some questions about its condition. For example: Does a crater rim look thin and sharp? Is it more rounded? Is it broken or erased in places? Or does it look so soft you can barely define the rim? What lies inside the crater? Is it a rounded bowl? Is there one or more central peaks? Does the floor look smooth and flat, or can you see what looks like flow marks? Do the inside walls show gullies? Landslides? Slumps that make concentric terraces? Then what lies just outside the rim? Is the crater surrounded by "flower petals" of debris? Not all craters show such a blanket of ejected material, but those that do are likely younger than ones that don't. If two craters lie close together, can you see evidence that the formation of one crater affected the other? 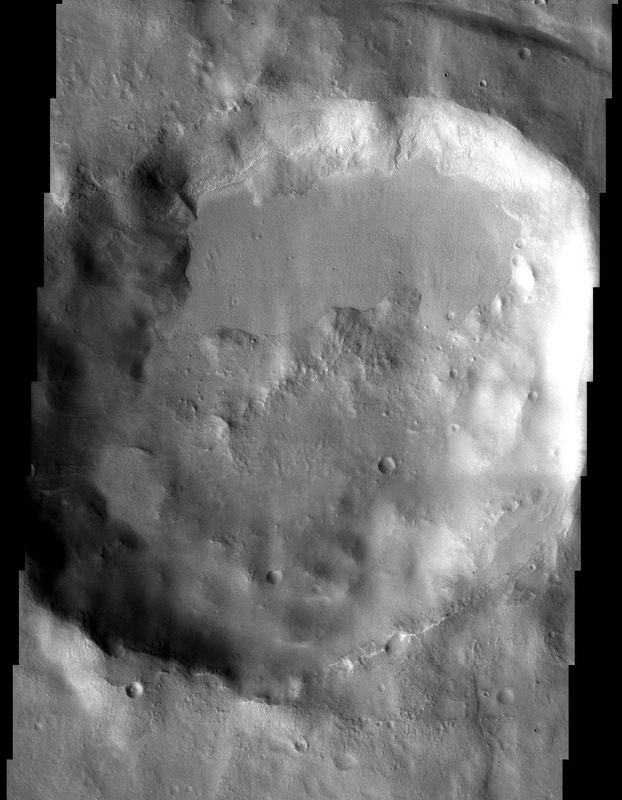 Sometimes one crater's ejecta will lie on top of a neighboring crater. 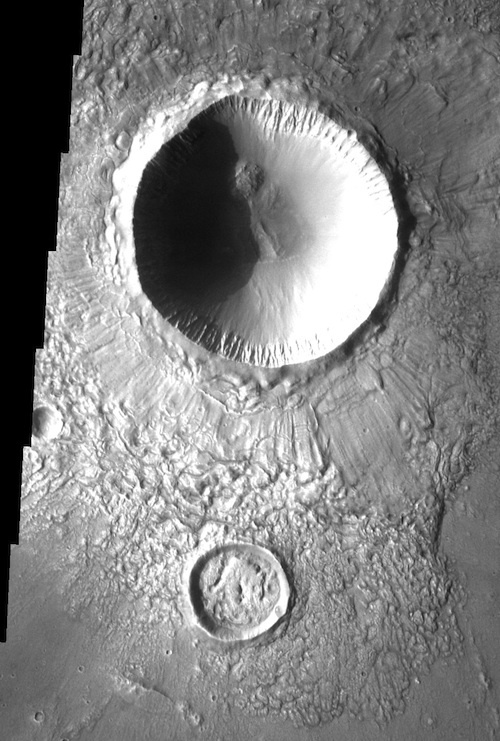 If so, the crater that spread the ejecta is the younger of the two. Or perhaps a fracture slices through one crater but seems to disappear under another. If so, the sequence could be crater #1, then the fracture opened and cut into the first crater, then crater #2 formed and obliterated part of the fracture. As you look at Mars images, play detective as scientists do and try to place the features you see into a sequence of events. This is called establishing your criteria for assigning crater ages. While your criteria may be somewhat different from another scientist, what is important is communicating your criteria and why they were selected. These factors let scientists assign relative ages to craters. But without having actual formation dates in years — which mostly requires rock samples brought to Earth laboratories — scientists have a hard job telling which crater is older, if both show many of the same age-marks. And many cases exist where there simply isn't enough data yet to settle the matter. A key fact to keep in mind about Mars is the speed of geologic change there. Weathering and erosion occur very slowly in comparison to what happens on Earth. Thus ancient Mars craters, even if greatly modified, can survive for billions of years. For example, the Opportunity rover explored the much-eroded remains of numerous old craters on its drive across Meridiani Planum. Yet small craters only a few weeks or months old have been spotted from space by the HiRISE camera on Mars Reconnaissance Orbiter, when it re-imaged areas covered previously. These craters, therefore, are known to be fresh. A few even show white ice at the bottom of the crater. Given local environmental conditions, this ice will disappear in a few months' time at most. While statistics are still sketchy, these observations lead scientists to estimate that, globally, Mars sees about 200 impacts each year that produce craters at least 4 meters (13 feet) wide. Interestingly, more than half of the impacts in this size range produce clusters of craters rather than single ones. This suggests that meteorites that are small, or weak, or both, break up as they enter Mars' atmosphere, but don't have time to separate very far before striking the ground.